Anyone volunteering in Thailand or just visiting has got to try and make it to this magical festival. 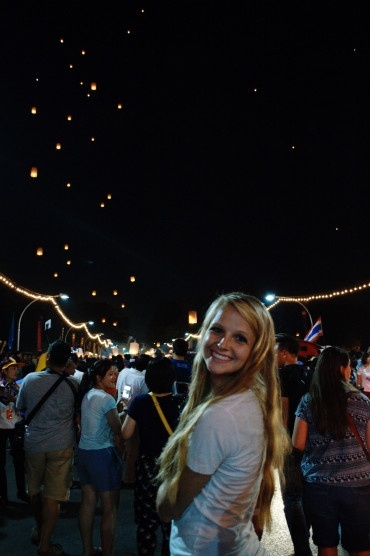 Interested in traveling to Thailand for the lantern festival? International Language Programs (ILP) sends volunteers to Thailand to teach English to children so if you volunteer with us, choose the Fall semester! That's when the festival is so you'll get in on the action as well as have enough time to really see all of Thailand. Volunteer spots are limited and fill up fast, so apply now! How Many Lantern Festivals Are There? There are actually two main lantern festivals that happen in Thailand. The most popular festival is the Yi Peng Lantern Festival in Chang Mai (that link has tons of info!). 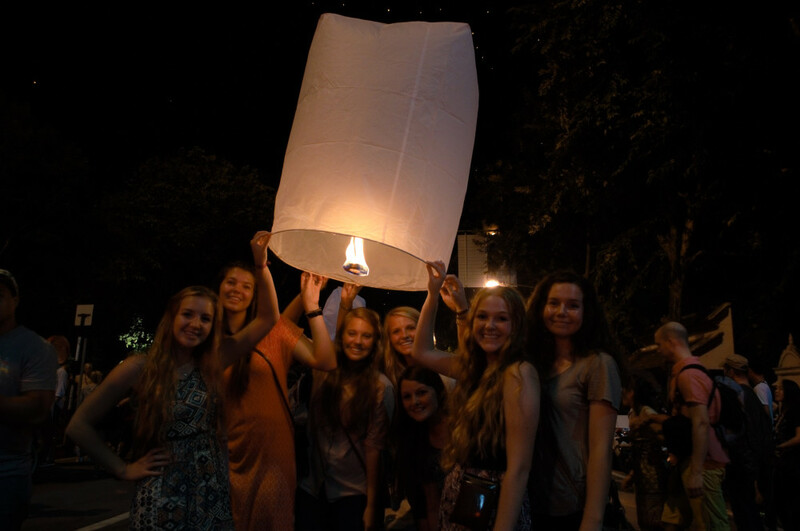 The second lesser known, but equally awe-inspiring festival, is the Mae Jo Lantern Release. The Yi Peng Lantern Festival is a religious ceremony performed in the Thai language that gives people the chance to pay homage to Buddha. Releasing the lanterns represents letting go of bad memories and making a wish for the future. During Yi Peng, traditionally, monks were the ones who released the lanterns, but now anybody can do it. 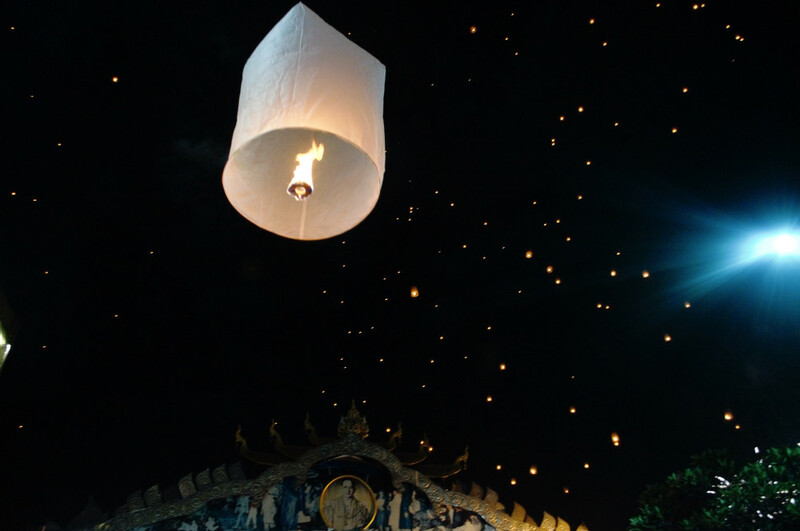 The floating lantern release at Mae Jo is arranged by a private Buddhist group, Duangtawan Santiparp Foundation in association with Tudongkasatan Lanna (Lanna Meditation Sanctuary). The Mae Jo Lantern Release, and the day time festivities involved with it, is also a religious ceremony. The festivities throughout the day are all done to help the people make merit. In short, merit is a concept in Buddhism (and Hinduism) that accumulates as a result of good deeds, acts, or thoughts and which carries over throughout their life and the subsequent incarnations. Tips for travelers: Keep in mind that these are religious events. If you plan to attend, make sure you dress appropriately (keep your shoulders and legs covered). Traditionally, people dress in white. Remember to be respectful and quiet during the prayers prior to the lanterns release. When And Where Are The Festivals? Head to Chiang Mai, Thailand on the Lanna Dhutanka grounds (behind the Mae Jo University). The dates for the festivals change every year and is usually held on the full moon of the second month on the Lanna calendar...which is usually sometime at the end of October or in November. About 20 miles outside of Chiang Mai, in the small town of Mae Jo. The dates for this festival also change every year but are usually held on a Saturday, a week of two before the Yi Peng Lantern Festival...which is also generally sometime in October-November. Pst: Chiang Mai is a rad place to do some vacationing. While you're up there for the Lantern Festival make sure to make the most of your trip - we've got a Thailand Destination Guide and Chiang Mai is #1 on that list (it also has tips on where to find the best Thailand beaches!). If you want to send off your own lantern (who wouldn't? ), you will need to buy one. There will be plenty of vendors around that you can easily purchase one from. They typically cost around 100 Baht - which is about $3 USD. Head's up — You have to wait and buy one there because they want all the lanterns to be the same size and color, so please don't bring ones from home. 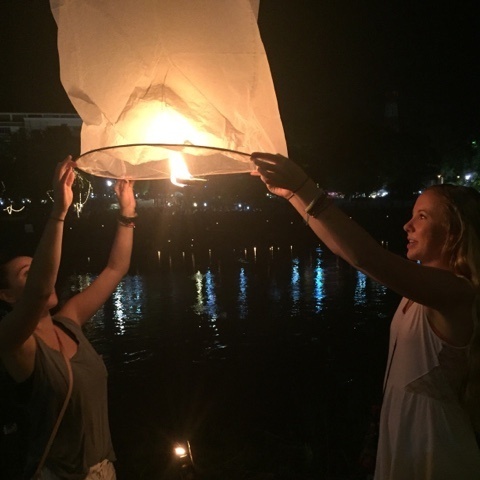 "Since we arrived back in August we have been planning our trip to Chiang Mai to see the flying lanterns. It turned out that the night of the main festival was a Wednesday which was a slight inconvenience for us, since we teach English during the week, but nothing we couldn’t work around. We decided to rent the private van to take us to Chiang Mai and back in one night. We left right after we were done teaching at 2:00 PM and we got home at around 4:00 AM. It was beyond worth the long night. Words cannot even describe the joy I felt looking up and seeing hundreds of lanterns in the sky. There was so much excitement and so many people we were completely entertained.... I literally can’t find words to describe the experience." Ready to head to these famous and awe-inspiring lantern festivals? Click that button and apply! Thailand is one of the more popular programs so we have tips on how to get into the semester you want ... but one of the top tips is applying early!